One Robbery Led to Three Workouts… Including a Long Walk to the Police Station | Keep It Up, David! 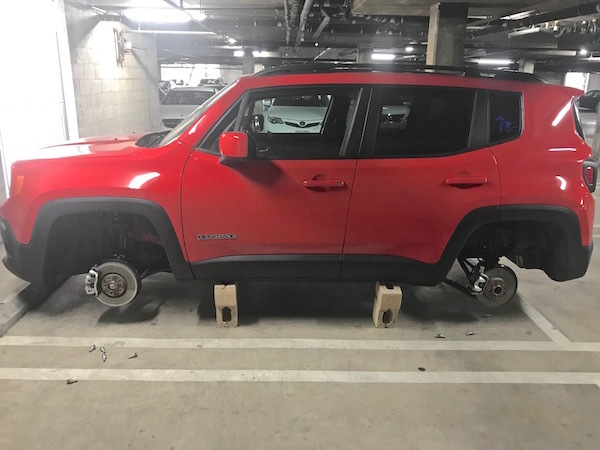 We have security cameras, so I’ve seen the thieves in action: they followed another car into our garage, scoped out my Jeep and another Honda, stole a clicker from a third car, then left and came back to steal my tires and rims, as well as the Honda’s. They left both cars on cinder blocks. My insurance was great – they set me up with a mobile vendor that brought new tires and rims to me less than 48 hours later, since my car wasn’t able to be towed. 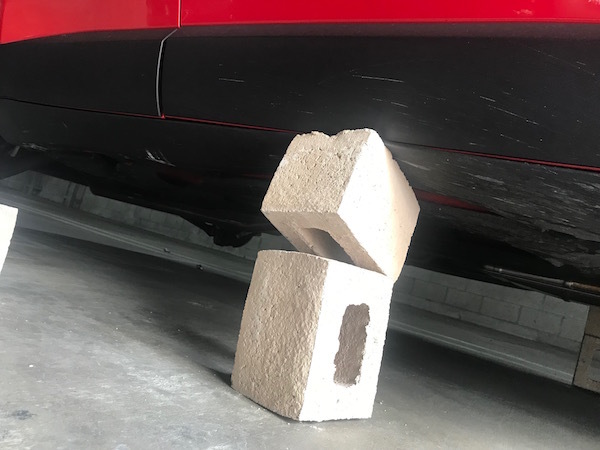 I still have to take my car to a body shop, since the cinder blocks dented and cracked my undercarriage, but that will be covered too. But this post isn’t meant to be a pity party. The whole thing was just a minor inconvenience more than anything. 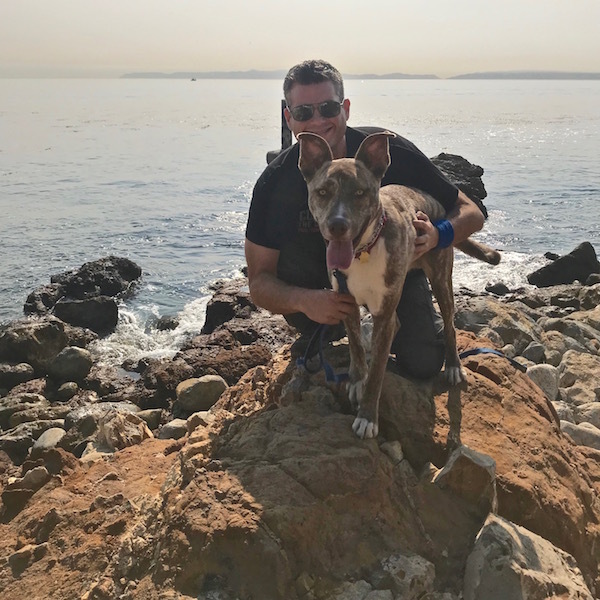 This post is about making the most of the crummy situation and getting some exercise in! I reported the theft to the police, and after a couple frustrating phone calls, went to my precinct in person. That precinct is 2.2 miles away, so I walked it. And walked home. I had done two tough workouts in a row and was ready for a lighter day, so it actually worked out perfectly. The first thing I did once my car was operational again was take it to a local service center, where they looked at the suspension, just to make sure the thieves didn’t cause any bigger problems. (The suspension was fine.) My car was due for an oil change anyway, so I had that taken care of as well. Instead of waiting in the lobby for my car, I went for a run. There’s a four-story parking garage a couple blocks away, so I ran there, ran up and down all the ramps twice, and ran up and down the stairs ten times. The run was 47 minutes, and I covered 2.8 miles + 40 flights of stairs up + 40 flights down. Then, today, I woke up bright and early and took my car to the dealership, so I could have the locking lug nuts that I had ordered a few days earlier installed. The locking lug nuts should deter this sort of thing from happening again! That’s over ten miles I get to add to my Cardio Miles, all thanks to one dumb robbery! 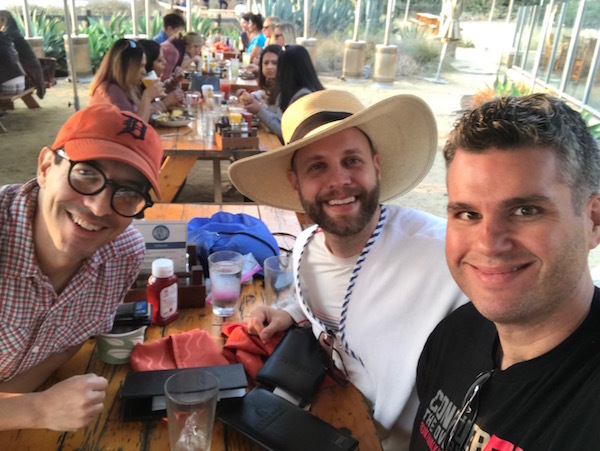 My first real outing on my new wheels was to Palos Verdes, a beautiful area south of Los Angeles, where I went on a hike with my friends Steve and Jonathan. JJ and Steve’s dog Krueger came too. We walked a loop along the coast, down to the ocean and then up to the top of the cliffs. Then we had lunch at Nelson’s, a restaurant at Terranea, a fancy-pants resort. It’s dog-friendly and has a big outdoor patio. 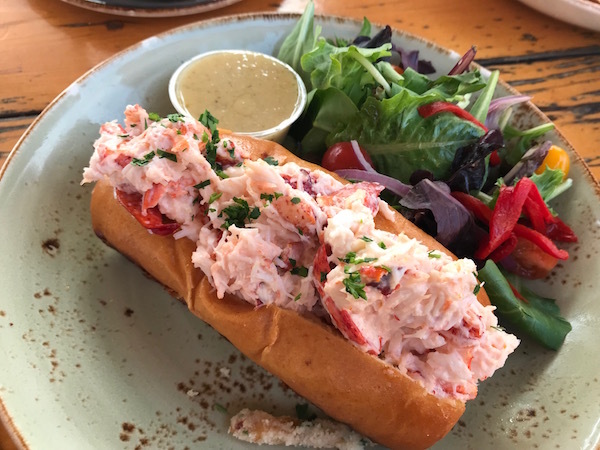 I don’t order lobster very often, but this was the place to do it, so I ordered the lobster roll, with a side salad instead of fries. It was amazing. It was served on a brioche bun, and was loaded with lobster. No fillers, very little mayo. I’m glad it was amazing, because it cost $29! All together, I covered 4.6 miles that day. And enjoyed a healthy(ish) lunch! This entry was posted on Monday, November 12th, 2018 at 6:23 pm and is filed under Uncategorized. You can follow any responses to this entry through the RSS 2.0 feed. You can leave a response, or trackback from your own site.